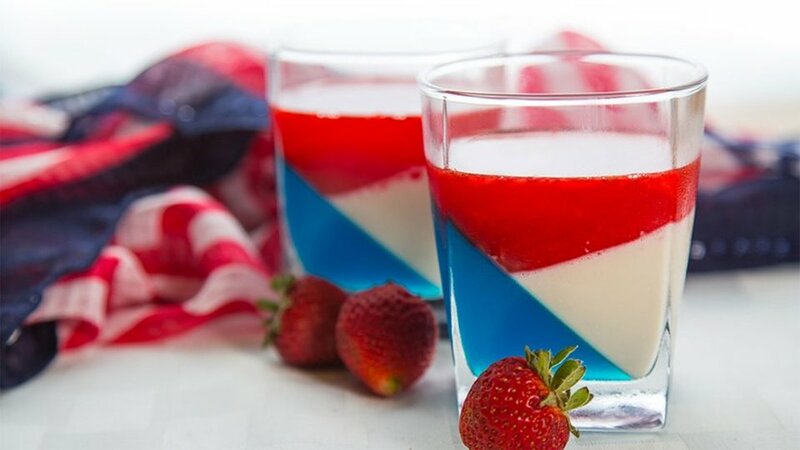 Dazzle your friends (and your Instagram followers) this holiday weekend with these easier-than-they-look patriotic jello treats. In a glass bowl, mix blue jello with 1½ cups boiling water until fully dissolved. Add 1½ cups ice water and let it melt completely. Add 2-4 scoops BCCAs and blend until the entire mixture is dissolved and of a uniform color. Pour evenly into four cups. Place the cups in the fridge balanced carefully on their sides, and allow to set for 15-30 minutes. In a new bowl, combine ¼ cup milk and 1 envelope gelatin to create the white portion. Let it stand at room temperature. In a small saucepan, bring the remaining milk to a simmer over medium-low heat and allow it to bubble for 1 minute, stirring continuously to prevent burning. Remove from heat, stir in sweetener and vanilla extract, and add to the white gelatin mixture. Stir until smooth and let cool for approximately 10 minutes. Once the blue layer has set and the white layer has cooled, remove the glasses from the fridge and add the white layer. Place cups back in the fridge at a slight angle or flat for 15-30 minutes. In a glass bowl, mix red jello with 1½ cups boiling water until fully dissolved. Then add 1½ cups ice water and let it melt completely. Add 2-4 scoops BCCAs. This is where you can also add the chopped strawberries if you want them. Once the white layer has set and the red layer has cooled, remove the glasses from the fridge and add the red layer. Let set for 15-30 minutes in the fridge.